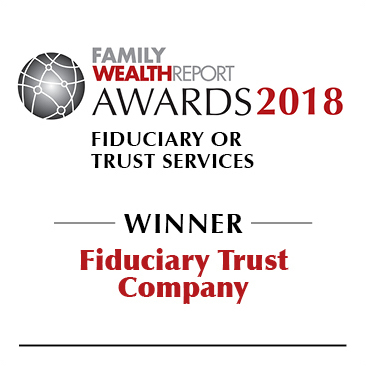 BOSTON – Updated July 2, 2018 – Fiduciary Trust Company, an advisor and investment management firm for high-net-worth individuals and nonprofits, was recently recognized by Family Wealth Report for “Best Fiduciary or Trust Services” in the private client category. The 2018 award is part of fourteen accolades Fiduciary Trust or its officers have earned over the past year, reflecting the firm’s ongoing dedication to providing its clients with personal service that stresses integrity, expertise and disciplined investing. Last month, Massachusetts Lawyers Weekly named Chief Fiduciary Officer Stacy Mullaney a 2018 In-House Leader in the Law at a March event in Boston. The publication also honored the firm in 2017 with its Best Wealth Manager Award based on input from a reader survey. Fiduciary Trust is a privately-owned wealth management firm focused on individuals, professional advisors, family offices and nonprofits. Fiduciary Trust’s capabilities include customized wealth planning, investment management, trust and estate services, and family office, tax and custody services. Founded in 1885 as a family office, Fiduciary Trust takes a personal approach based on expertise, strong performance and a genuine commitment to act in its clients’ best interests. The firm’s client focus has enabled it to achieve a 98% annual client retention rate for over a decade.